This entry was posted in Media on March 29, 2010 by admin. This entry was posted in Customized Builds on March 22, 2010 by admin. The new son meets his 31 year old father. Thank you again Tamiya for making such possible, giving every Tamiya-fan the opportunity to build a NIB SRB, a must-do in the life of every Tamiyast (like a planting a tree)! Unfortunately weather is poor and photos don’t give the chosen paint tones fully justice, especially the champagne gold. This entry was posted in Customized Builds on March 14, 2010 by admin. We decided to move Tamiyablog from blogger to wordpress to enable us much more options and capabilities. Of course this way also the layout and design had to change, but it already gives some useful new features like a better blog search, an article categorization, as well as links to the last articles and comments. The only downside we could find till now is that somehow some older comments were lost during the transfer, but you are like before welcome to post comments again. We hope you also find the advantages exceeding the habit of the old form. This entry was posted in Event Report on March 10, 2010 by admin. A few considerations about the Special Racing Buggy and the re-release Buggy Champ and Sand Scorcher. First, I feel the need to write a “disclaimer”, before somebody gets the impression that I dislike the SRB’s or Tamiya in general. I’ve been in love with the SRB since getting my first Sand Scorcher right after it was first released, have continuously been into SRB’s since then and have actively collected SRB’s by buying back from customers when regular parts supply started to get scarce in the late eighties. So I have quite a few and have of course bought the re-releases and I’m very happy that Tamiya has revived them. Still, I think it’s appropriate to present a few views that may not suit the euphoria associated with these models, and then end this text with the enthusiasm and hopes for the future that the SRB surely deserves after all! I know the text is pretty long, but it’s still a very “light” and quite superficial look at a long piece of Tamiya history. I have refrained from posting any pictures as other sites dedicated to Tamiya and RC are currently flooded with SRB-pictures anyway. At the time the SRB was first released, there were no similar electric-powered off-road vehicles in the market. As I was just a kid at the time, I don’t have a complete overview, but considering that Kyosho just had the Peanut series and Rally-Sports series and Tamiya until then just the Cheetah/XR311, the SRB surely revolutionized the way people were thinking about EP buggies. 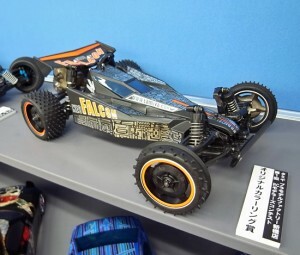 Until the Kyosho Scorpion and AYK 566B were released, Tamiya had this new niche market practically completely on their own without any serious competition. Bolink tried to get a piece of this increasing market with the Digger 10. 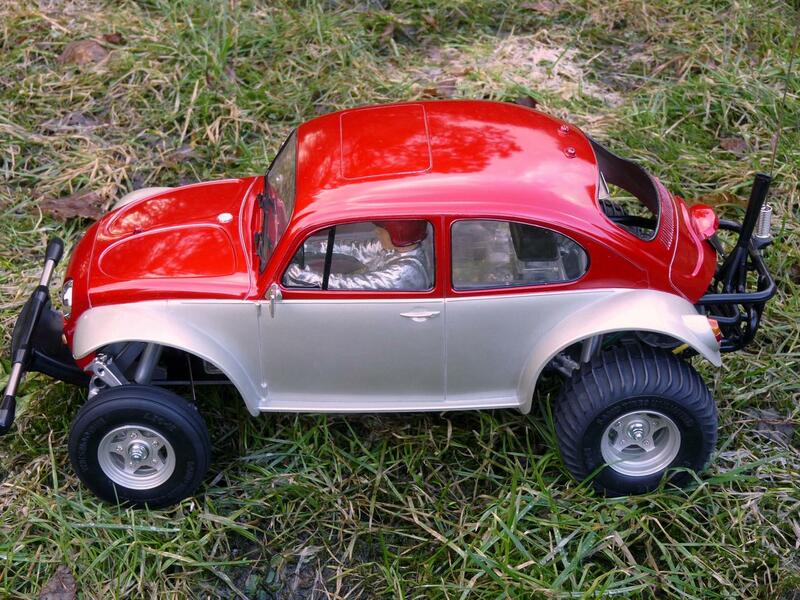 It was basically a 1/10 pan car with foam “off-road” tires, a pan car rear axle “hinged” in the middle with a universal joint to create some rear suspension and topped with a lexan body copy of the Rough Rider body, and that was about it. As revolutionary as the SRB was, it had an innovative concept for its time, but technically, it wasn’t really well tested. Even back then, most (if not all) weaknesses were very clear to those who were actually running and racing these models, and it’s easily understandable why aftermarket companies like RCH, CRP, Kimbrough, MIP, JG and others could grow so rapidly and successfully. Of course, though some companies offered components to improve the handling, durability improvements were most important and the main focus for those of us who ran or raced the SRB. Just to mention a few things that were considered weak points also back then. 1. Front suspension pins. Bent very easily and damaging the suspension arms when being bent. 2. Servo saver. The lack of a bearing made for high friction after some use, and servos at that time were generally not strong enough to overcome this high friction. Also, running the radio gear off 4 cells (especially when using dry batteries), the available steering torque was really inadequate for the rather poor steering mechanism. 3. Steering rods. Being 2mm and basically the same design as used on Tamiya’s 1/12 pan cars, they were much too weak for the 2+ kg SRB and in off-road conditions. 4. White “teardrop” ballraces in the front suspension. Very quick wear, especially if greased like recommended in the manual. 5. Nylon middle gear in the gearbox. Rotating at relatively high speed between a brass gear of the same dimension and a bigger nylon gear, wear was excessive. 6. Radiobox. Heavy and brittle and not really waterproof. Today’s hype of the “great waterproof” SRB is not justified at all, and mostly claimed by people who don’t have any actual experience with the SRB. Also, flex in the chassis plate and the loose wellnut in the rear hole, often caused the radiobox to get damaged even if not subject to a direct impact. Because of the brittle material, very small forces were adequate to damage the box. 7. Motor cover. Being the same brittle material as the radiobox, it would easily crack and disintegrate. Not a big issue for most who ran the SRB, but still annoying. 8. Rear cage. 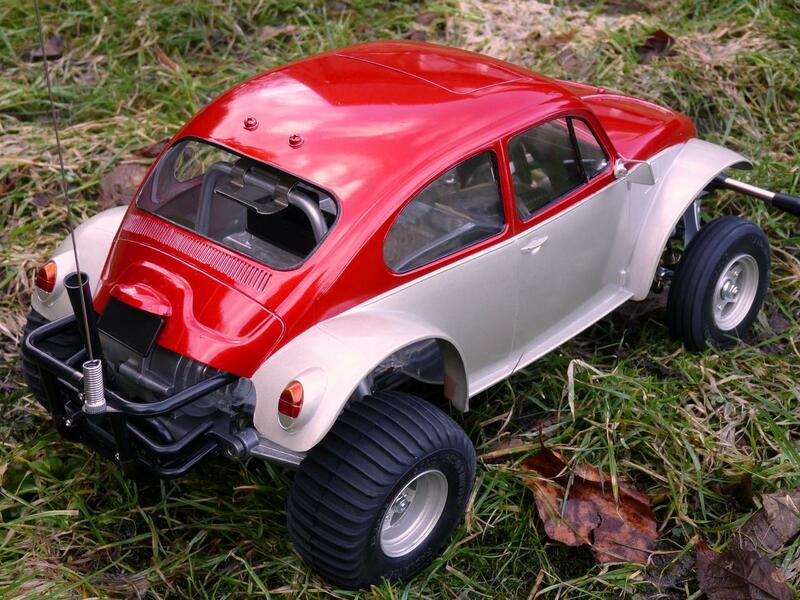 Unlike Kyosho, who chose a tough and flexible material for the Scorpion’s rear cage, Tamiya opted for a better looking, but much more brittle material. 9. Front bumper. Heavy and weak. Also, being quite expensive as a spare part, the tendency to break after just a few impacts was very annoying. 10. Dampers. Leaking badly even when new and being much too small for such a heavy model, the model was underdamped even with new and properly working (hypothetically) dampers. 12. Rear axles. Both the final gear axle and the wheel axles themselves would bend quite easily, and the weak universal joints allowed for a lot of slop and bending, which made the situation even worse as the “interaction” of bent axles and sloppy universal joints accelerated the wear and deformation of both. The listed weaknesses and many more actual weaknesses were addressed by many aftermarket companies, sometimes well, sometimes less well. Also, a lot of money was made on aftermarket parts that weren’t of any actual benefit at all, but that’s the same for any model today too! Anyway, as much as I love the SRB and as nice as it is to look at and run, they were underdeveloped and inadequately tested by Tamiya before release. Many enthusiasts have a very romantic view of the SRB today, but fact is that Tamiya didn’t do their homework fully and properly, not just in hindsight. 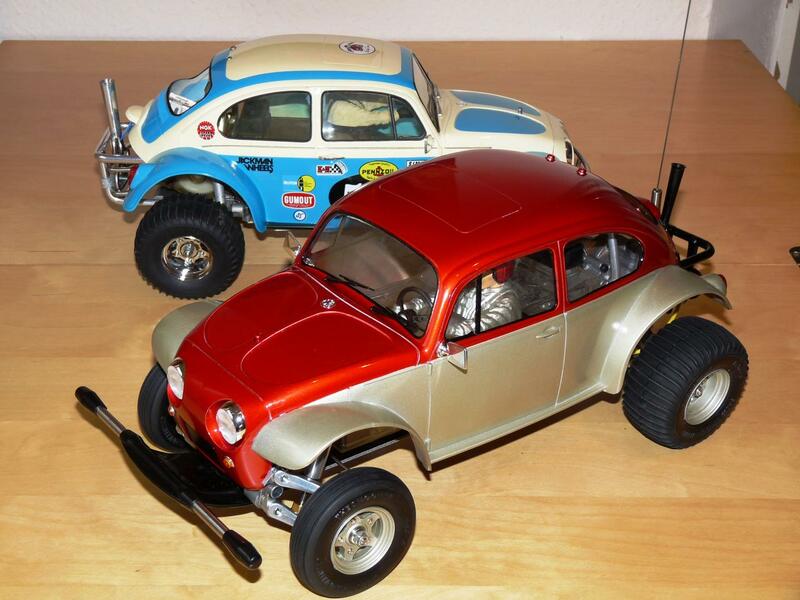 When you look at how much better the Kyosho Scorpion (and partially also the AYK 566B) were when released just a year or two later, although they had their share of weaknesses too, Tamiya’s excellent scale model skills, but also moderate RC-car technical skills, become evident. As for using diecast parts, the typical understanding of metal being better than plastic doesn’t really apply. Of course, plastic material technology has improved a lot the last 30 years, but nylon was available back then too, and I guess that Tamiya could have made most of the diecast components of nylon instead, creating a more durable and lighter model. However, maybe nylon was more expensive than diecast parts, or maybe metal was considered superior to plastic by most customers, just like today? 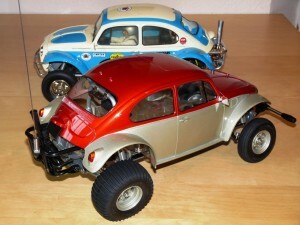 The use of diecast parts on early models make them easier to restore to a good finish today than modern models with plastic parts, so from a collector’s point of view, the use of diecast parts is now rightly celebrated. 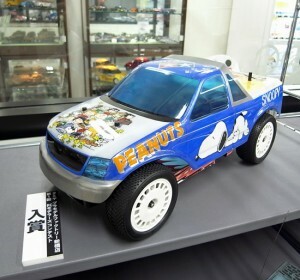 Also, the use of diecast parts on the Kyosho Circuit 20 series of GP buggies (and other manufacturers of GP buggies too), might have influenced Tamiya to use diecast too. 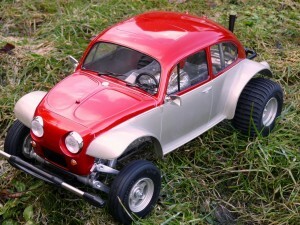 So, apart from fantastic bodies, relatively authentic suspension, a great scale look and founding a new niche of RC-cars, from a technical point of view, the SRB’s weren’t even great for their time and companies like Kyosho, with a lot more experience and knowledge about chassis design, quickly proved with the completely superior Scorpion that it would have been possible for Tamiya to make the SRB a lot lighter, more durable and better handling even without sacrificing looks. In other words, the SRB wasn’t THAT great, not even back then. Currently, the interest in putting differentials into the SRB has caused some persons and even Tamiya themselves to offer ball differentials. But why? Tamiya could have included a diff with the SRB from the very beginning, but chose not to. Maybe to some degree for technical and cost reasons, but probably mostly because a differential wouldn’t offer any advantage for the average owner. The SRB was intended for loose surfaces and sand and even most GP-buggies didn’t have differentials at that time, and for today’s typical fun use, I can’t really understand why anybody would spend money on a differential for their SRB. I generally love improvements and hop-ups myself, but why spend money on something that actually is a drawback for the use where the SRB is the most fun? 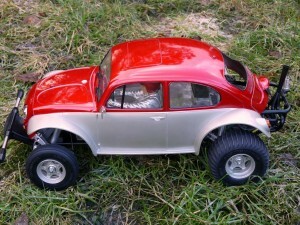 Sure, when buggy racing got organized, Kyosho and others rightly started to offer differentials as an option. So, when the Super Champ was released and was intended for organized racing, the competitors already had differentials available, and the rear-heavy Super Champ made a differential even more necessary when running on a track. As such, I think it was a mistake not to develop a differential for the Super Champ or even the SRB after customers started to use them for organized racing. In the early ‘80’s, I ran SRB’s with aftermarket differentials in organized racing myself, and still own some CRP differentials, but currently have none of them installed in my SRB’s as it doesn’t have any sensible purpose anymore. By the way, when talking about the Super Champ, back when it was released (and even today), I couldn’t understand why Tamiya didn’t include any of the improvements on the other SRB’s. The better servo saver, tempered steel front suspension pins, better steering rods, brass middle gear and steel universal joints could all have been incorporated in the Rough Rider, Sand Scorcher and Ford Ranger without hurting scale looks and probably also at a very moderate extra cost. These improvements would have made the models a lot more durable and enjoyable. Difficult to understand, especially when considering that the other SRB’s were offered for several years after the release of the Super Champ. Of course, in 1983 (when the Super Champ was released), Tamiya already had plans for the future and knew that the remaining life of the SRB was limited. 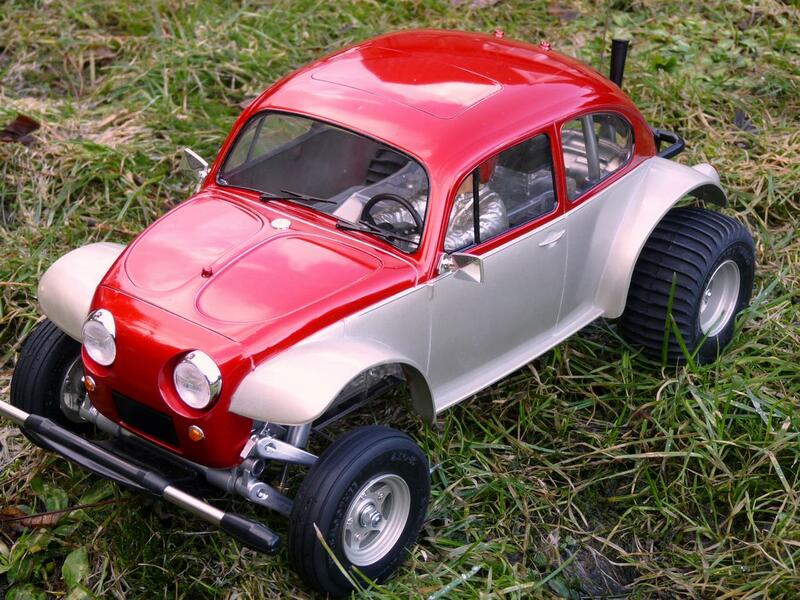 For the fun market (not organized racing), the market dropped massively after the Scorpion was released and even more so after Tamiya released the much cheaper, quicker and more durable ORV (Brat, 037, Frog). By the end of 1984, only people with a special interest in scale models (almost nobody back then), would buy an SRB when they could have an ORV, Scorpion or other models at much lower cost and with a lot less trouble. As I was working in the business, I closely observed how the interest in the SRB dropped quickly, and in Norway where I lived at the time, the remaining stock of SRB’s was so unsalable that they were offered for about EUR40,- in the end, at roughly ¼ of original suggested retail price. Even at this price, it was hard to sell them. As for the racing market, the SRB boomed and dominated the buggy class from the very start and until 1983, much with the help of the aftermarket business. The AYK 566B was a hot contender, but the aftermarket for it was always moderate and quite a lot of manufacturing defect issues (especially gearbox) ensured that it never really got well into organized racing. With the release of the Scorpion, the SRB got very hot competition. Being much lighter, better balanced, generally more durable and much better handling, the SRB would have been without a chance in racing if there hadn’t existed so many aftermarket parts for it. At the 1983 World Championship (ROAR, not IFMAR official world championship) in Anaheim California a heavily modified Scorpion won and more than any other single event marked that the days of the SRB were over as a competition model, even when massively upgraded with aftermarket parts. But then again, the Scorpion won against Associated RC10 prototypes with a very small margin, and it was evident that realistic scale buggies were about to leave the arena for the benefit of purposebuilt racers. With the release of the RC10, the SRB was finally “dead” as a model for organized racing, and at about the same time (early 1985), 4WD models would occasionally start to win races. Kyosho Progress and Hotshot being examples, and by 1986 replaced by the Optima and Supershot/Boomerang. 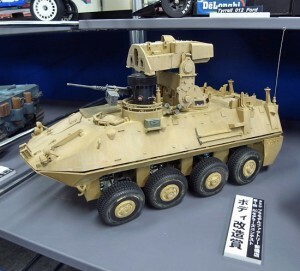 Still, even with 4WD entering the scene and the superior Scorpion, it was the RC10 that really “killed” the SRB as a competition model, whereas cheaper alternatives (mostly from Tamiya) made customers loose interest in it as “fun” model. As such, the SRB’s lifespan in the market was limited to 4-5 years! Almost hard to believe now, considering its current popularity! 1. Aluminium wheels seem to sell quite well already, and are offered by quite many sources, although a comparison of quality of several of them shows that sources from Far East offer the best and most consistent quality, combined with lower prices! 2. Reproduction stickers of the original SRB-stickers are of course popular as replacements for the “generic” stickers included with the re-release SRB’s and will probably remain popular for years to come. Also here I have compared the quality from several sources and quality is mostly disappointing, also from the sources that are often considered to be the best for reproduction stickers. If time allows, I will write an article for Tamiyablog soon, presenting the SRB reproduction with the by far best quality so far. 3. Bodies. To my knowledge, there currently doesn’t exist a single aftermarket body with acceptable quality. The lexan- and ABS-bodies offered for the SRB from several sources are so inferior to the original bodies that they aren’t suitable for anything but hard thrashing, but that’s not what the SRB is about, is it? 😉 I however hope that some of the Japanese manufacturers, which probably are the only ones capable of making bodies that could be real alternatives to the original bodies, may consider the market large enough to have a go. 4. 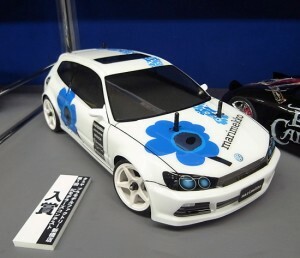 Boxart style front bumper, rear cage and nerf bars are to some extent already available, and one of the best companies is about to release their versions. Personally I look very much forward to that and feel confident that they will remain good sellers for years, keeping in mind that the overall market is pretty small. Some also offer chassis plates for the SRB, but I have yet to see a design that is significantly better than the original chassis plates. 5. For durability and precision, just like for the original SRB, I think there is a pretty good market for improvement parts for the steering mechanism. A pretty good cure that still looks pretty “scale” is using the steering linkage and servo saver from the Super Champ (like I do on all my SRB runners), but considering that these parts aren’t easy to find anymore, I would love to see somebody address this major weak point of the SRB. 6. So what about gear cover, motor cover and even radiobox? Well, especially the radiobox, even with all its flaws, is one of the things that has made the SRB so loved, and with the improvement of plastic technology and re-relase parts being easily available, I hardly think there is any market for an alternative box or radiotray. As for gear cover and motor cover, the diecast gearbox of the SRB, though somewhat better cast on the releases, still looks pretty rough and crude by modern standards, so in my humble opinion, machined aluminium covers look a bit out of place. Also, the original gear cover was never really a problem unless the screws were tightened too hard, so what remains for me is the wish that somebody will offer a stronger motor plastic motor cover. That said, I’m pretty happy with the availability and price level of the motor cover for the rerelease anyway! 7. With the availability of “small scale” dampers, I can hardly imagine that aftermarket dampers specifically for the SRB will sell well, and generally I think most will keep the suspension pretty original as it’s part of the charm of the model. I would love to see somebody offer tempered steel pins for the front suspension though and was in fact surprised when the Buggy Champ was released with “soft” pins, as bent suspension pins and the resulting crooked front suspension wasn’t at all considered “charming” back in the old days and hardly is even now! 8. Well, what do you think? Dummy parts to improve the scale looks maybe? Dummy airfilters? Dummy boxer engines? Scale looking floorpans? Sound modules? Light kits? Some of these items exist already, but the combination of excessive prices and mostly inferior quality surely makes for an opportunity of those quality-oriented enough and with a healthy understanding of the balance of demand and offer, to take a large portion of this market. Your ideas and views are very welcome and though we’re in no position to make any promises, we have already presented our ideas to one of the most serious manufacturers of aftermarket parts, and would be happy to forward your ideas as well. Any way we turn it, we’re in for a lot of fun in the coming years! With the re-releases, dreams have again come true for many of us, but never being really saturated, at Tamiyablog we’re excited to see what Tamiya have up their sleeve next. A brand new scale buggy? Holiday Buggy or Sand Rover re-release? Keep dreaming, and at least some of the dreams will come true! This entry was posted in Reviews, Vintage on March 2, 2010 by admin.